It sounds so simple right? But over at 100happydays.org they have 71% of participants that do not last the 100 days. The main reason: time. Can you believe we have forgotten to take the time to be happy? Sure we live in a world that increasingly is driving us, pushing us, schedules, deadlines all around. Being busy has become a badge of honour. It’s become a competition of who can get the most out of their days. In doing this we are not getting anything out of our days. We are existing; running the hamster wheel – We are not living. And we certainly are not happier doing it. I’m joining Lucy from Lotus Vitality (www.lotusvitality.com.au) for this challenge. Will you be joining us? You don’t even need to start the same day. When you register at 100happydays.org you get to pick your start date, so there is nothing stopping you! We will be sharing our pics on our instagram and Facebook pages (links on our websites). 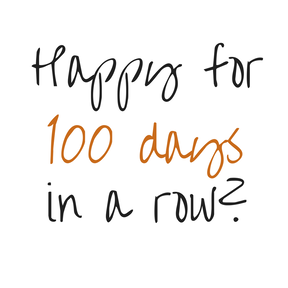 When you post your pics use #thenourishingway and #lotusvitality so we can join together on our 100 days to happy. This challenge isn’t about turning your life upside down. It’s not about adding in more. This challenge is about finding those small moments in everyday that bring a smile to your face. It’s stopping for 30 seconds to smell your coffee before you drink it. It’s looking up into the evening sky as your driving home a from work and seeing how the light hits the clouds. It’s pausing whilst you are eating and being happy for the food you have. The best thing about this challenge it’s about you! It’s about what makes you happy. Like everything I encourage here at The Nourishing Way, it’s about YOU. You don’t compare your happy to someone else’s. They will always be different. It’s not a competition. This is a challenge for you. I’ve been listening to Brené Brown (yep a little in love with her at the moment) talk about vulnerability. In doing this she speaks about how we use fear and foreboding as the thieves of joy. The example she gives the following scenario. Picture a movie: There is a family driving along a motorway on their way to a Christmas celebration. The kids are in the back. There is Christmas songs playing on the stereo, to which the kids are signing along to. Mum looks at Dad, smiles and they also begin to sing along. The Christmas spirit is high. Then camera pans out… What happens next? Most people instantly think of them crashing. A truck hitting them. Running into another car. Something terrible. We are wired to think like this. When we are experiencing joy, something bad will happen. So what do we do? We spend our lives preparing for that something bad. We think about what can go wrong and start to build up our defences around this. If you’re a parent I can almost guarantee you’ve done this. Popping in to check on your child seeing them sleeping, feeling that rush of love, of happiness. Then what. You think to yourself, I would not be able to live if something happened to them. You start running through your mind all these horrible scenarios when what you should have been doing was enjoying that moment. Watching them sleep and feel that love wash over you. We can all remember a time when we were dating. It could be a new relationship or you could have been together a while. You really like this person. Things are going along great. Then something happens. Maybe they didn’t respond to a situation like you had expected. We instantly armour up and start steeling ourselves for the worst. They are going to leave, they don’t care about me. We go to a place we’re we begin to prepare for that outcome. But whilst we are doing that we are not remembering the moment that morning when they said they can’t wait to see us. Or the lovely evening spent together the night before. The fact of the matter is no amount of preparation for a situation in which you may get hurt, heartbroken, leaves you sad, will help that situation when it comes. It still hurts. It still tears at your heart. What I can guarantee is that every moment you spend thinking, preparing for that situation takes you away from joy. In those moments you are living in a state of fear and foreboding. We need to lean into joy. Yes it may mean that we will sometimes get hurt. But think of all the joyous, happy moments you will truly experience that you otherwise may have missed out on by living in the fear. Lean into joy! And this is why I’m doing the #100happydays. I’m leaning into joy. It will take practice and what a perfect platform to do it. I want to encourage everyone to lean into their joy. At The Nourishing Way we help you find a life that makes them hum, filling your life with energy! Guiding you towards taking back your health through sustainable lifestyle changes based on your idea of balance. Hormone imbalance affecting sleep, mood, energy, performance and reproductive state.